All of the urinals on offer are portable to provide convenience to the user. The urinals are ergonomically designed, making them easier to use and gender specific. Absorbent powder is also available to help clean up spillages, as well as convenient holders. 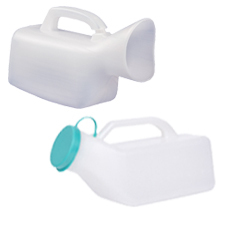 Urine bags are ideal for those on the move or on long journeys and enable the safe and convenient disposal of liquid.